I’m absolutely delighted to have been invited by co-chairs Viv Rolfe and David Kernohan and the Association for Learning Technology to present one of the keynotes at the OER18 Conference in Bristol next year. The theme of the conference is Open for All and I’ll be talking about how we can engage students in open education, why we need policies to support OER, all wrapped up in a personal reflection of what openness means to me. Opening OER16, CC BY SA 2.0, Anna Page. We all have one conference which is our conference, the one event we never miss year after year, where we go to recharge and reconnect with our people. For me that conference has always been OER. 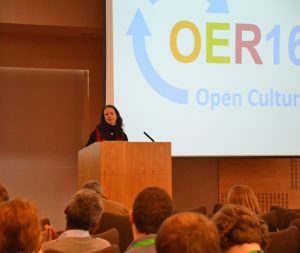 I’ve never missed an OER conference and it’s been a real pleasure to see how the event has grown and developed over the years, under the careful guidance of ALT. So it’s a real honour to be invited to present a keynote at OER 18, particularly as I’ll be following in the footsteps of so many inspirational women who have had such a profound influence on my own career as an open education practitioner; Maha Bali, Catherine Cronin, Josie Fraser, Melissa Highton, Sheila MacNeil to name just a few. Thanks to everyone for all the enthusiastic and supportive messages on twitter yesterday, I’m on annual leave this week, so I missed the actual announcement! As soon as I get back I’ll look for forward to talking to you all about what we as open educators can do to ensure that education really is Open for All. This entry was posted in oer, Women in Tech and tagged altc, oer, oer18, open, OpenEdFeed, openscot. Bookmark the permalink.